Wolf are one of those bands; you may not know them overly well, or be familiar with their back-catalogue, but when you do hear them, you're going to like them unless you are the most miserable person on Earth. This is Wolf's seventh full-length album since their beginning in 1995. At this point there is only one original member left in the band; vocalist and guitarist Niklas 'Viper' Stalvind, which may lead long-time fans of the band to wonder where Wolf's sound has headed now, after so long playing none-too-serious Heavy Metal with their tongues firmly lodged in their cheeks. What 'Devil Seed' offers is a much more mature and elegant approach for Wolf. Here is the sound of a band that wants to be taken seriously, among existing fans, those who are yet to discover them, and indeed their critics and peers. The opening instrumental 'Overture In C Shark' lays down a darker template than Wolf usually utilise, but it turns out to be a track that is reminiscent in weight and impact to Anvil's 'March Of The Crabs'. This then leads into the first full song, 'Shark Attack'; a slick, streamlined piece of headbanging brilliance that will easily stand as one of the coolest songs you hear this year. Everything from the riffs, to the melodies and the solos make this a propulsive, full-throttle Metal song that grabs your attention. 'Skeleton Woman' is a slow-burner, that almost has an Avenged Sevenfold-esque vocal melody to it. There's a creepy vibe that has an element of catchiness to it, but the following track 'Surgeons Of Lobotomy' fares far better, with an absolute peach of a riff driving it on and on without a hiccup. The lyrical theme follows the idea of humanity's descent into madness. As I said; this album is a lot more mature than previous Wolf albums. 'My Demon' has a great chorus, and sounds like a Judas Priest song that Judas Priest never wrote, 'I Am Pain' on the other hand, features the kind of riff that wouldn't have been out of place on an early Iron Maiden song, again bringing a creepy element to the fray that is a fair contrast to Wolf's usual fun-and-games lark. Most praiseworthy on this record is the quality of the song writing. Each song is different, but they all have an inherent flavour that give the album a sense of direction and identity that makes it stand out from not only Wolf's back catalogue, but from all the traditional Heavy Metal albums of recent times. 'Back From The Grave' is an accomplished, multi-layered and well executed song that really has everything one can look for in classically-styled Metal. This is also true of 'The Dark Passenger'. This is the album that should bring Wolf a whole new generation of fans, and it would only be right for this to be the case. 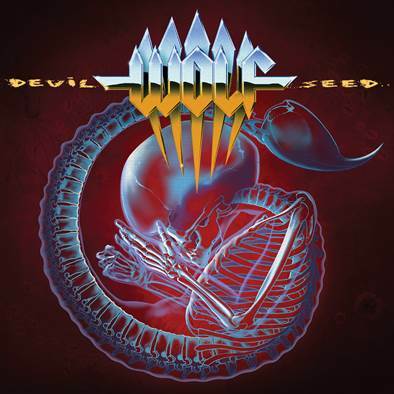 Yes, there are many bands channelling the spirit of Metal's beginnings, but Wolf have done so to the Nth degree on 'Devil Seed'. Grand Magus might want to start watching their backs, because Wolf have staked their claim to the riff-writing throne in a stylish and confident manner. Believe it or not, this is essential listening for 2014. True Scottish Metalhead!!! Ask me anything rock/metal related and I'll have an answer, I guarantee it!